Buying a home on the golf course is not an unusual occurrence around here. With more than 120 golf courses and country clubs throughout Coachella Valley, finding a home on a golf course is a common purchase. We have dozens of gated country clubs and golf course homes, properties intermingled throughout the course on different fairways, and other homes that just offer beautiful views of the golf course. At least once a week someone is looking for a home on the golf course and someone else's selling. If you've entertained the idea of buying a home on the golf course here are some important things to know. I'm not necessarily saying these things to deter you but it's important to understand what life on the golf course really means. I have had people come back after a purchase saying they didn't realize some of the negatives to buying a home on the golf course. I want all of my clients to be well-informed before they purchase a property and while life on the course can be a luxury, it does have some drawbacks. Living right next to the golf course means you may hear weed-whackers, lawnmowers, and trimmers early in the morning. Remember, golfers around here like to get out early so the maintenance crew needs to get out even earlier. Be prepared for 4 AM to 5 AM lawn mowing sessions and if you don't like that, consider earplugs, or a home just a little ways away from the course. Most people think it's a stray ball from time to time that ends up in their backyard but you would be surprised to know that golfers can end up in your backyard as well. Some golf courses around Palm Desert and Palm Springs have restrictions on fencing along the fairway so it's important to ask if golfers will be searching for their balls in your backyard. You might have people trampling over your flowerbeds or searching close to your house, which may be close to your bedroom window as well. It's important to talk about the general workings of the golf course so you know what to expect when you live there. 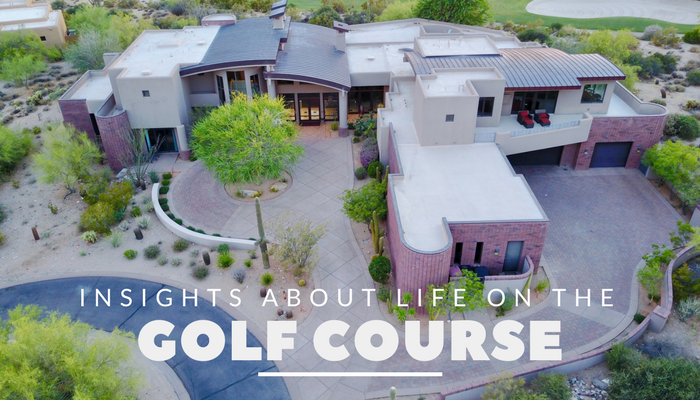 Many people choose life on the golf course because it increases the value of their home and it's a sort of status symbol for their lifestyle. Having a home on the golf course can be quite a draw for many homebuyers but, because it's not an unusual occurrence around our area, it may or may not be as prestigious as in other areas of the country. #4. Rules of the grounds. It's important that you understand your homeowner association rules, covenants and conditions before finalizing a sale for a home on the course. There could be some deed restrictions that require you to keep your property looking nice at all times. It also could be restricted use of the grounds, meaning you can't just wander into your backyard, which is also the seventh fairway. Make sure you understand all of the restrictions that the course has when it comes to homeowners right on the course. #5. Pets may not like it. Does your four-legged friend still go outside most of the time? They may not like people wandering through the backyard or close to your property line. You may get complaints if your dog tends to bark at people wandering by all of the time or they may actually be injured by a stray ball flying onto your property. This usually isn't something people consider until they move in, so if you have pets that will be spending some time outside, it's important to understand the risks. Now, I don't want to deter you from buying a home on the golf course if that's what you are looking for. But it's important to understand all of the details and risks that come along with buying a home on the golf course. There are beautiful options throughout Palm Desert for those that want to live right on the course or just within a golf course community. Sometimes it's just those added perks of the homeowners association that really appeal to buyers. Contact me anytime and let's discuss your needs about living on the golf course. Because I know just about every country club and course around the Palm Desert and surrounding cities I can offer suggestions and tips for finding the perfect home for your needs and budget.